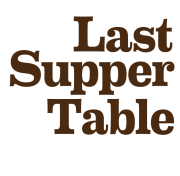 Until it is offered to the public, the Last Supper Table is a story that is personal to Andre and I. The project has grown tremendously from the skills and talent of Iron Coast and its two filmmakers, Mike Glinski and Andrew Stefanik. Of the hours of raw footage – often clumsy, sometimes painful, and rarely graceful – they are somehow able to piece together a beautiful story lasting only minutes. Their work is a reminder that the ability to surface what is most important, articulate it gracefully, connect it to context, and rally an audience around it – while appearing effortless – is no easy task. The third apostle embodies a very similar skillset. For that reason, Apostle No. 3, your contribution supports the storytelling behind this project – the hours it takes behind the scenes as well as in the finished product. Apostle No. 3, thank you.